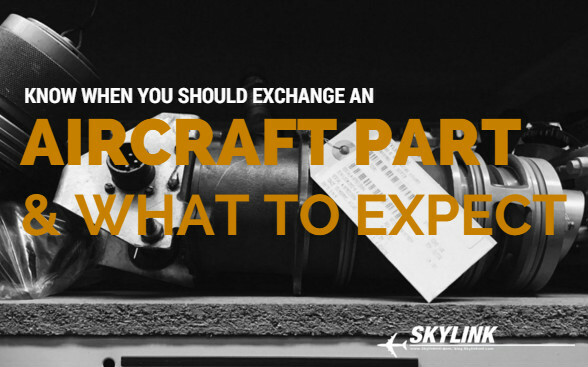 What’s an aircraft part exchange? Without boring you and breaking out the technical dictionary, it’s a mechanism where you receive a serviceable component and return an unserviceable core at a later date. While exchanges can be beneficial, there's a lot of room for losing-your-time-and-money errors. And the unfortunate truth is with hundreds of different exchange agreements, false promises and hidden costs, it’s tricky to weigh the benefits. Exchanges are mostly used as a result of maintenance visits, aircraft ground damage or FOD, or when you’re only removing the damaged part once (i.e. long install steps, special tooling required, fuel tank entry, etc.). It’s often not possible to obtain an exchange to cover an AOG, unless the component is in the local vicinity, or you have a couple days for the next flight departure. Taking on a long term exchange strategy only becomes beneficial for low removal rates. If you find you’re exchanging a part number often look into a more inclusive solution like pooling, leasing or purchasing outright. I’ll get into this more later in the post. When you’re looking to exchange a part, you have 2 popular options. One is the exchange plus repair model and the other is a flat rate exchange model. The primary difference in the two is how you’ll pay for the repair of your core return. For this exchange model you’ll receive a component, either in SV or OH condition. You’ll be required to send an AR (unserviceable) component back to your exchange partner within a certain time period, typically 21 - 30 days. Once they get your AR unit, they’ll repair it and bill you the cost to bring it back to the condition of the component you exchanged. The typical cost is 10% of fair market value but this can vary based on component. For a $10,000 unit, you’ll pay $1,000 plus the cost to repair the unit. Flat rate means you’ll only pay a onetime fee for access to the component. The repair/overhaul cost is built into the charge. Remember that you’ll agree to a fair average repair cost that built into this onetime fee. If there’s any overages you’ll have to pay the difference in cost. For a $10,000 unit, you may pay a $6,000 flat rate exchange price. Now, in this business, there’s no shortage of sneaky tactics to increase someone sales cost. The best way to defeat this is by working with someone you trust and who has your best interest, like our Never Forget Your Wings promise. It’s rare, but sometimes you’ll get someone who charges you a 3-5% processing fee on top of your exchange charge. This is a malicious charge. They won’t tell you of this charge when they quote you. Be vary cautious of these charges and the people who impose them. When you submit an exchange order you’ll have a certain amount of days to return a core. If you don’t you’ll be billed an additional exchange fee. Nobody likes additional exchange fees. Your supply partner should warn you that you’re nearing the end of your time to return a core. You also want to stay on top of this yourself in case they forget to remind you. Put it in your calendar, add a reminder to your phone, whatever it is, get the unit back on time. This is an unnecessary charge if you can avoid it. If you have a unit that looks like if feel from the sky, was in a fire, or was chewed by a sand storm, don’t send it as your core return. You’re going to spend more time and money than it’s worth. Your exchange partner will get the core back, open a work order and you’ll pay a high repair cost nearing the outright price, or you’ll pay an outright cost plus the exchange charge and all of your shipping and processing costs. For very infrequent removals that get you out of a pinch aircraft part exchanges are great but they aren’t always your best friend. Your entire operation shouldn’t revolve around them. If you find you’re frequently exchanging a part number look into purchasing it or adding it to your pooling agreements. Pooling becomes very beneficial if you have one or more removals per year. The moral of the aircraft part exchange story is, know what you’re getting in to, don’t rely on it as an overall material strategy, and you should know and trust your exchange partners. Have you had trouble with aircraft part exchanges in the past? Comment below.